Hi all and welcome back! 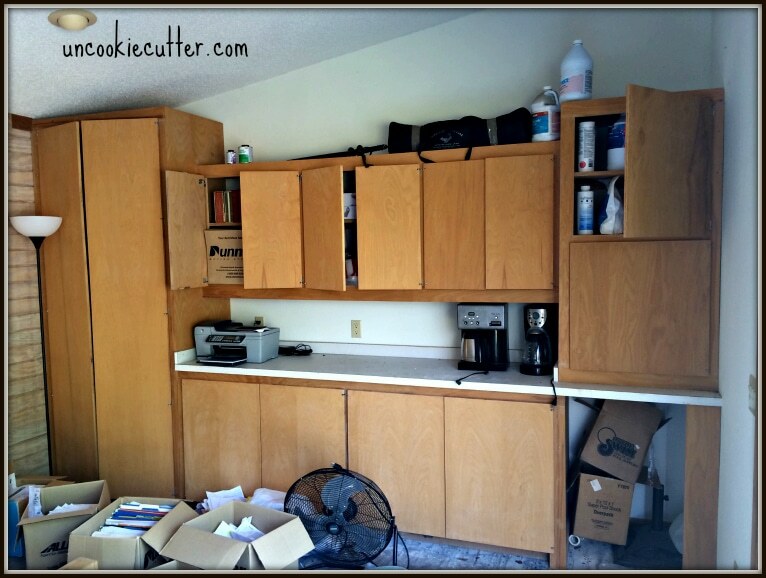 Do you remember my husband’s office makeover from this summer? If you don’t, here is a little peek at what we were dealing with before. This is a detached building from the rest of the house and this makeover took me MONTHS to complete. But, we are so happy to be done. 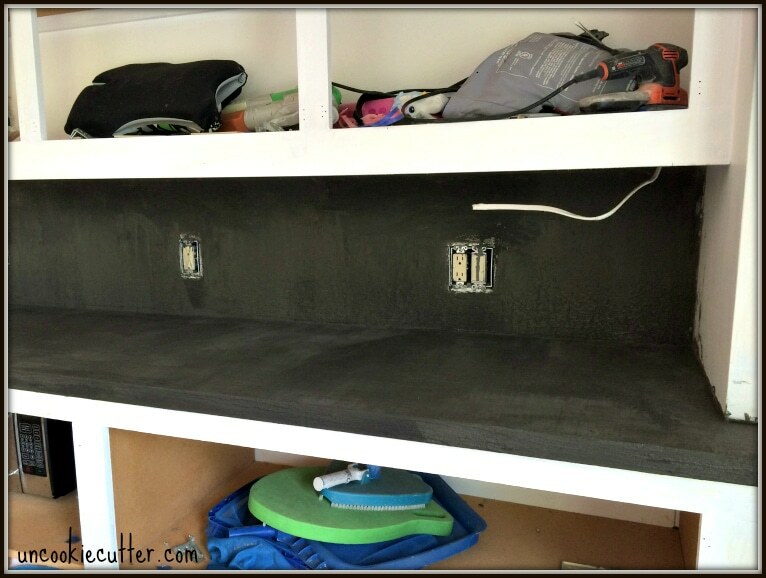 I redid the cabinet area with a concrete overlay and it was a very inexpensive way to give it a sleek new look. 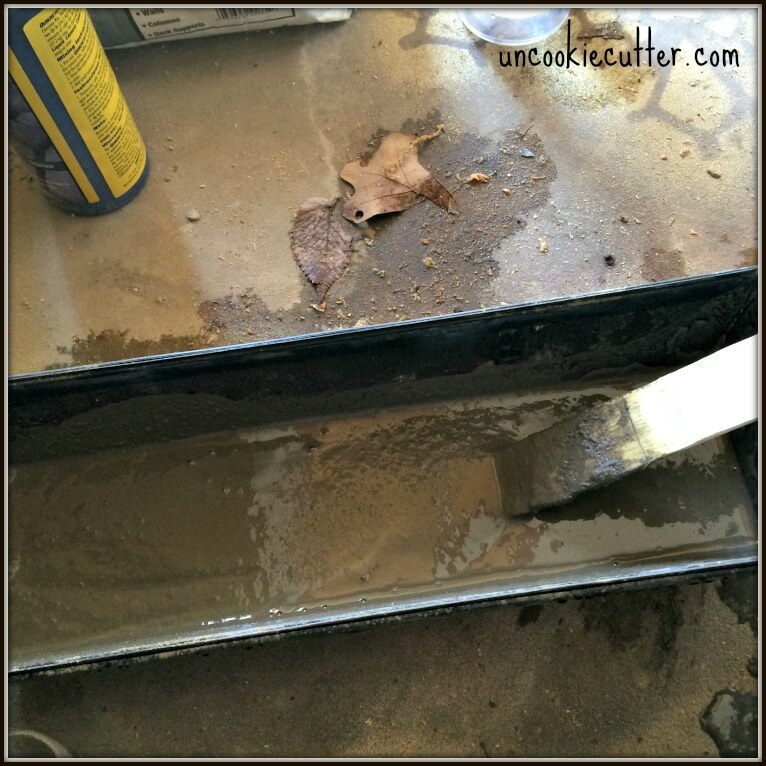 This post was first published on Sawdust 2 Stitches on May 5, 2016. I first got the idea for this from Tasha over at Designer Trapped in a Lawyer’s Body. I wanted to do a similar thing as she had done, but go all the way up the wall with the concrete. So, that is what I did! 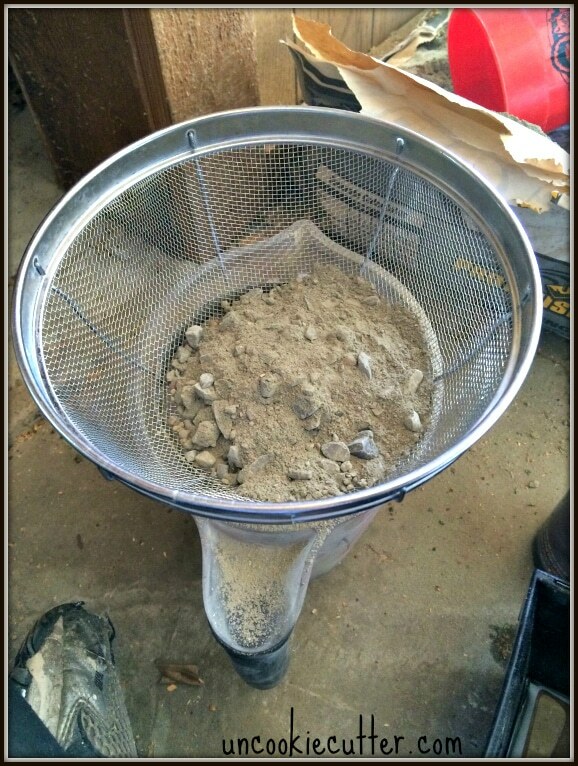 I had a $5 bag of concrete lying around, so I used that – but I did have to sift out the rocks. Tasha has a better trick to make it a little easier. Either way, you can’t have big ol’ rock in it for a concrete overlay like this. 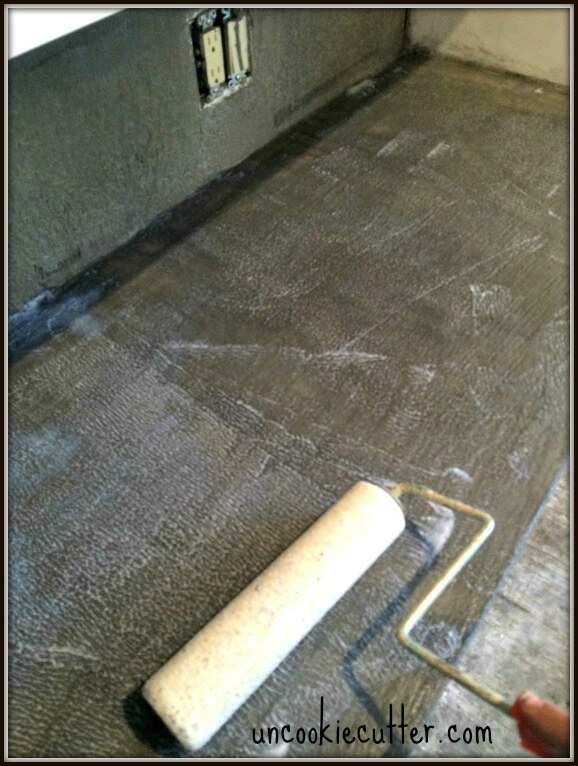 You don’t need much concrete for this – all three layers took less than half a bag. 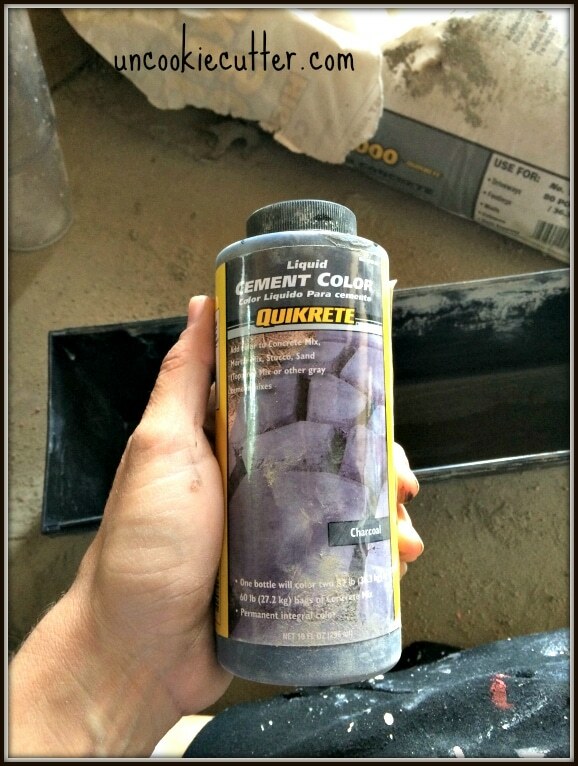 I used this fun color mix from Quikrete to give it a darker gray color, as opposed to the natural tan color of regular concrete. Be sure to mix this in the water BEFORE you add the concrete, believe me! 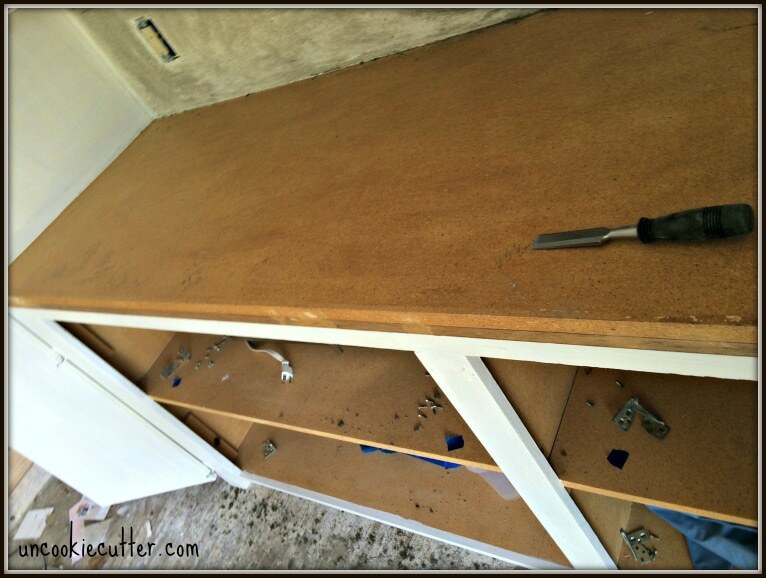 Once it was all mixed and colored, I pulled the laminate off the particle board and started applying the concrete. I just sort of rubbed it on. Use some thick, heavy duty gloves and then just sort of rub it in. It gripped to the particle board pretty well. Go visit Tasha to get all the good details. The walls were a bit tougher. I just started rubbing it all over the walls. I should have used gloves! This was after the first layer. 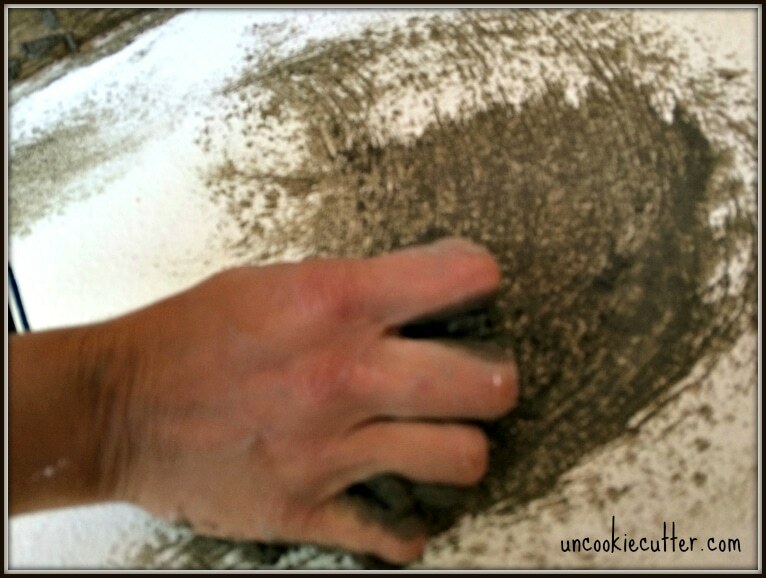 The second layer will be the hardest, because if you aren’t careful you will pull off the first layer. 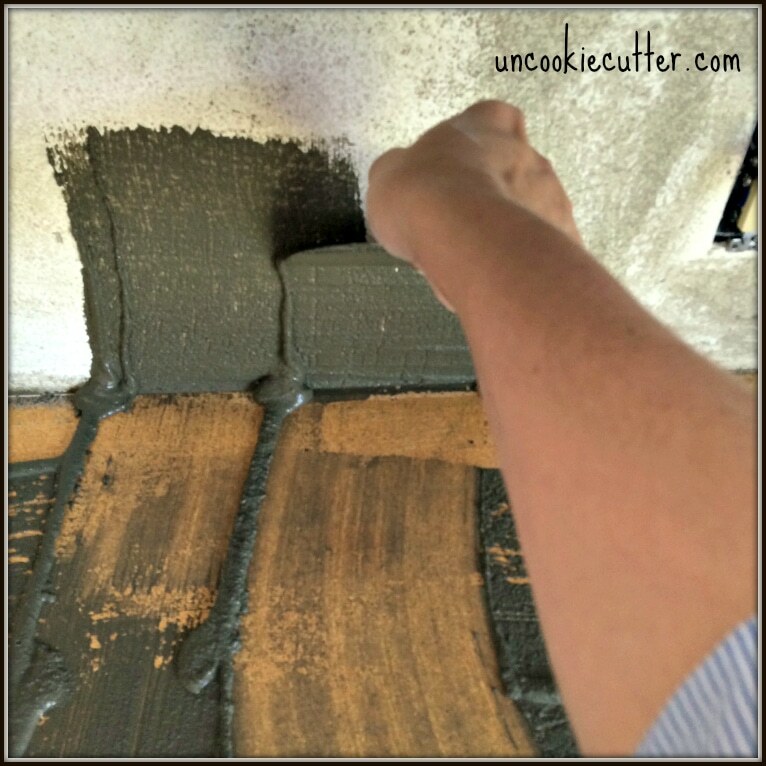 I made the concrete a little more “soupy” (is that a word?) and put it on with a scraper. It worked pretty well. 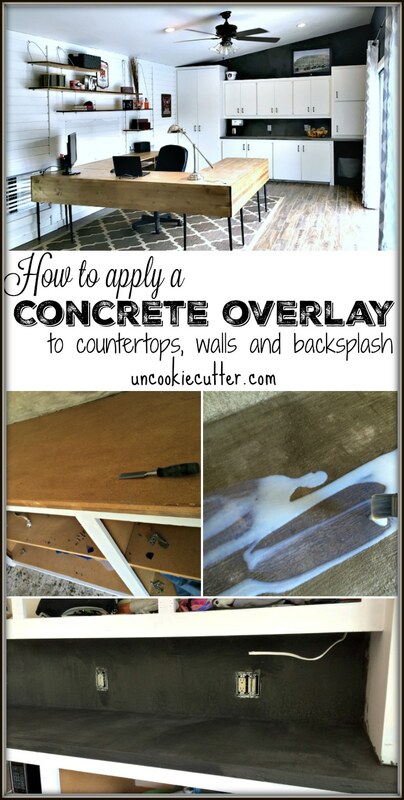 Concrete actually cleans up pretty easily, as long as you clean up the big chucks pretty quickly, you can wipe the smaller stuff away when you are done, so don’t’ worry so much about the mess. However, plastic tarps never hurt anything :). I went even thinner for the third layer. I poured it on the counter and then scraped it up the wall. 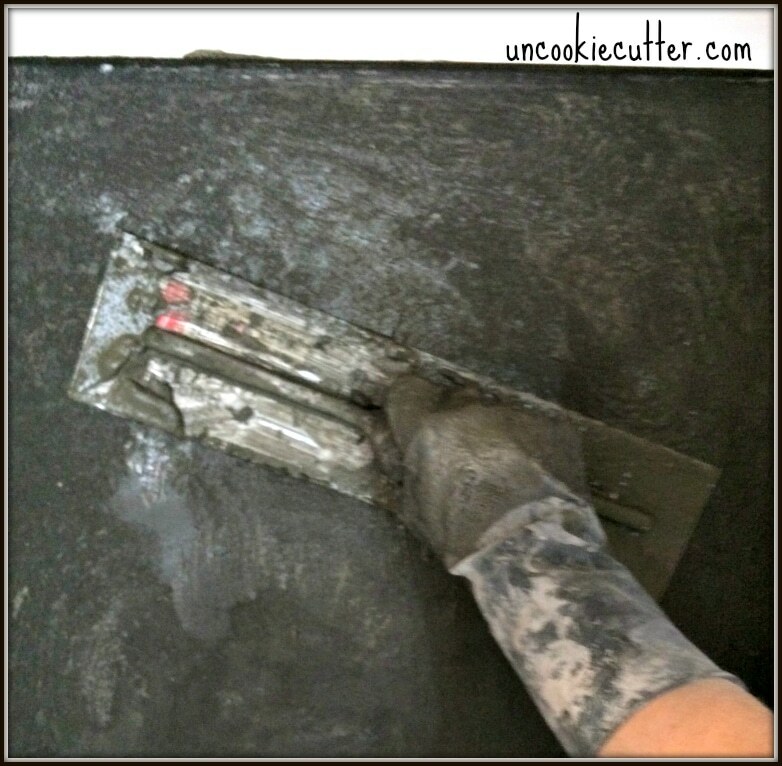 Next, I then took a trowel and smoothed it all out. 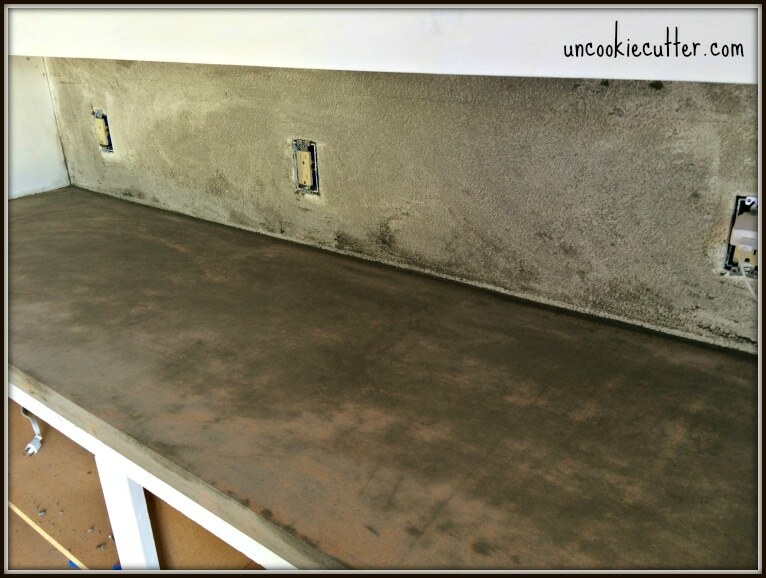 After the third layer had dried, I added a concrete sealer to seal it all up. Then, I added 3 coats of Poly to make it all hard and shiny (and super protected). 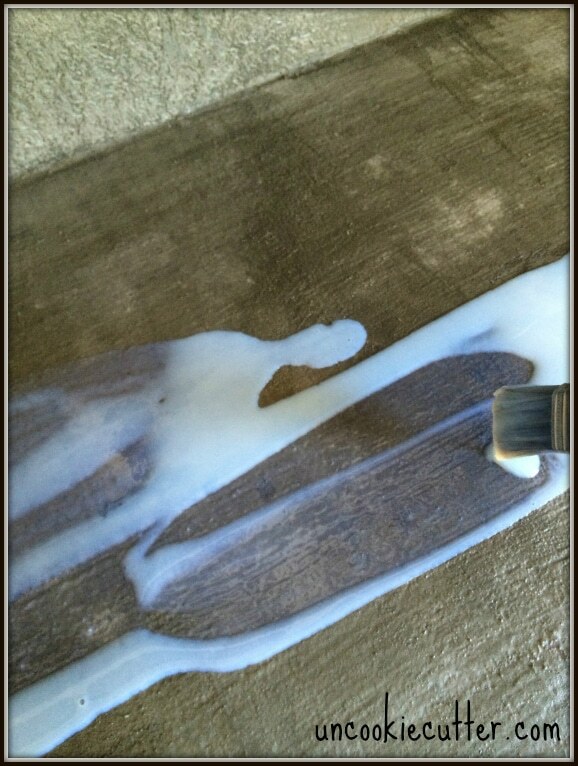 I didn’t use Polycrylic for the wall, I used spray on Polyurethane. You won’t need as much protection there. And that is pretty much it! I got this totally unique wall for under $25! 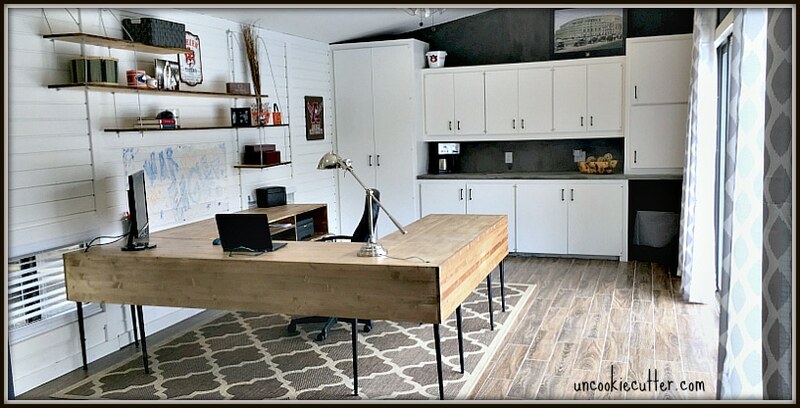 If you want details on any other project in this room – from paint colors, to that desk or those awesome DIY floors, check out the full office reveal post HERE. Let me know if you have any questions and thanks so much for stopping by! I really like the idea of putting colour in the concrete. Thanks Tracey, I love it! I’ve used that same color in a number of projects and it works out great everytime.